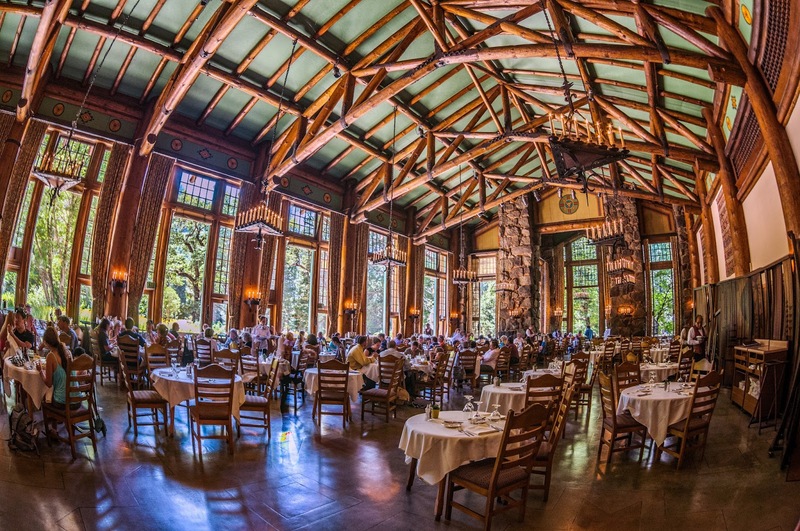 The Ahwahnee was built in 1927 to fit the need for a luxury hotel in Yosemite. 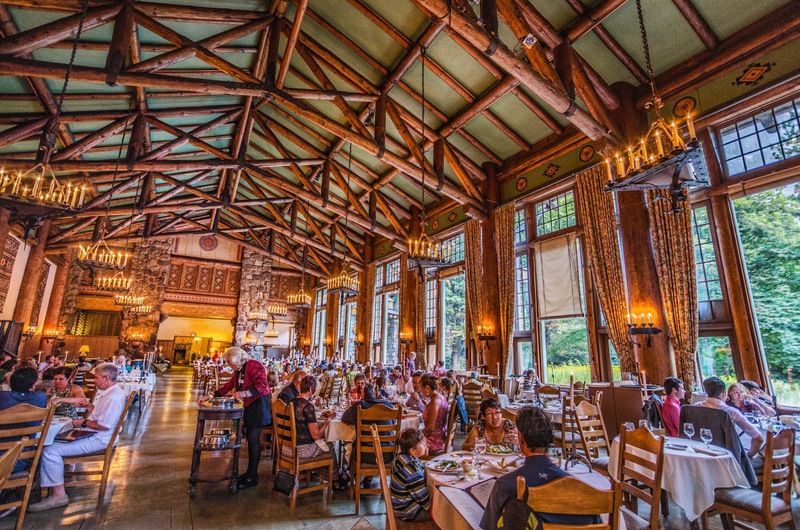 The Ahwahnee was a great way to keep money flowing into the park to support it, and it kept guests who preferred top-notch accommodations happy, so it was, and is, a win-win. 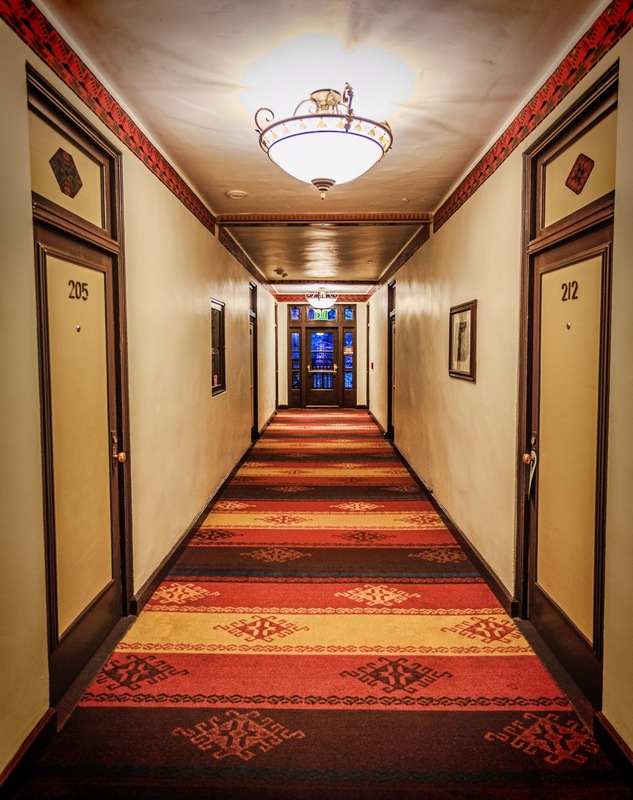 The historic hotel has seen many a famous guest from Judy Garland to JFK to Queen Elizabeth, and during World War II was converted into a Navy Hosptial. Although originally only guests were allowed on the grounds, today anyone can come and enjoy the splendor of this gorgeous piece of architecture. 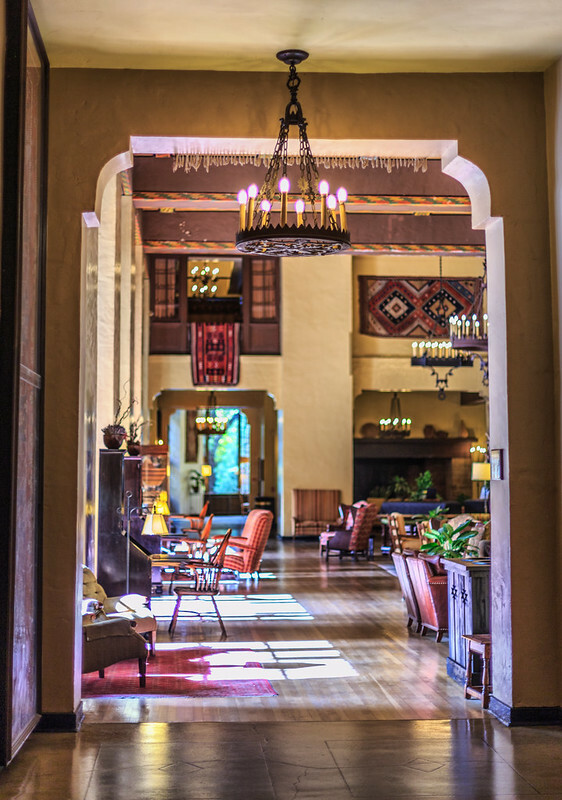 If the Ahwahnee looks familiar to you, you've probably seen The Shining. 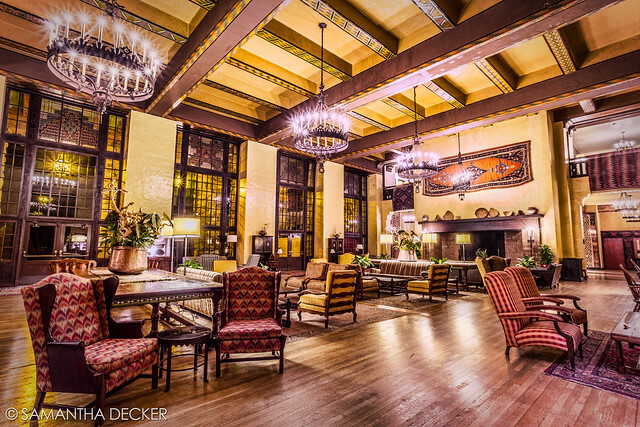 Stanley Kubrick drew much inspiration for the Overlook Hotel from the Ahwahnee. 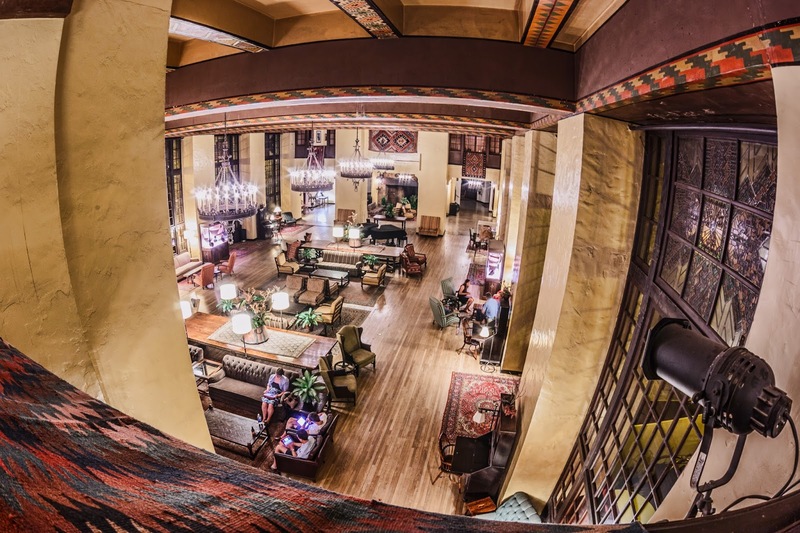 As you can see peering into the Great Lounge above, the hotel draws heavily on Native American motifs. 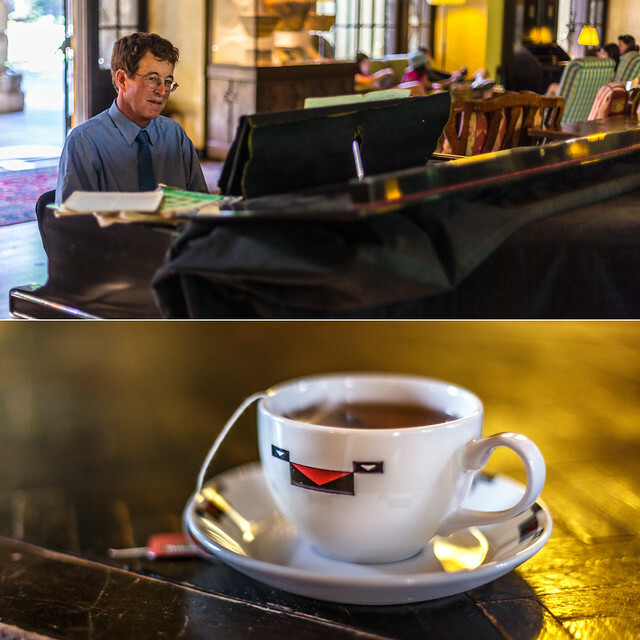 One of the first things we did when we got to the Ahwahnee was tea time. 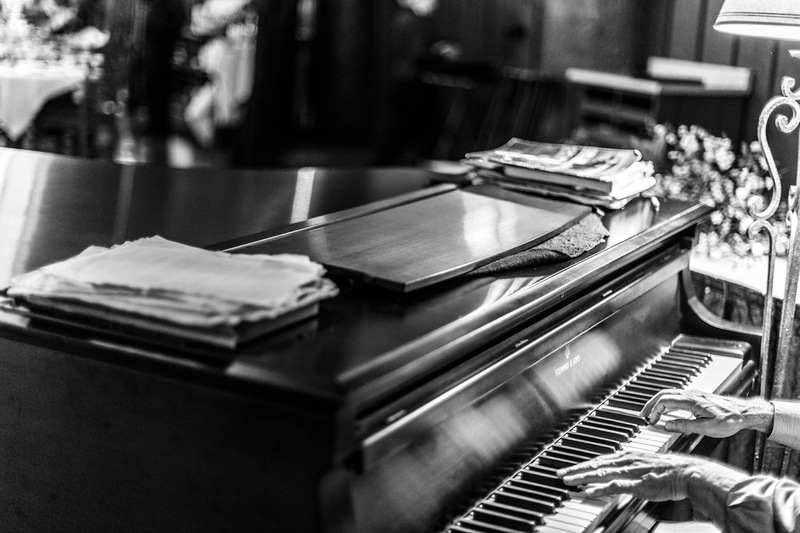 Guests at the hotel can enjoy a complimentary cup of tea and a cookie while listening to pianist Ted Long tickle the ivories. 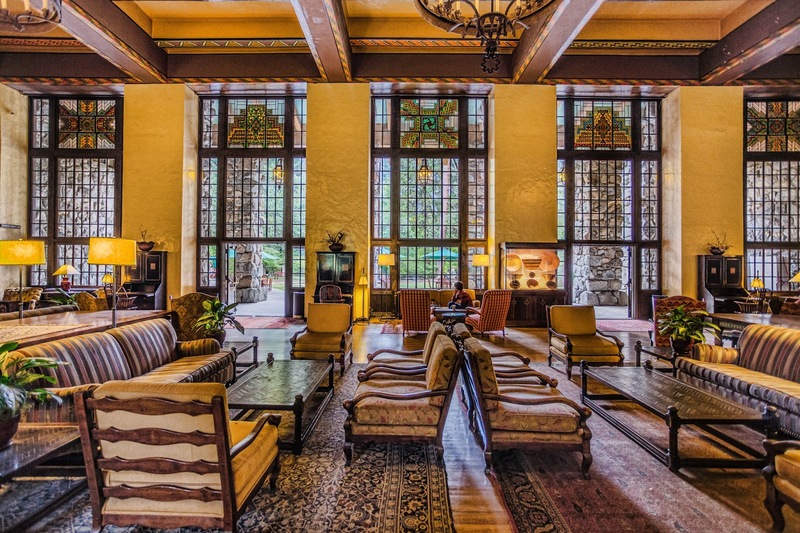 The Solarium is my favorite room in the Ahwahnee. It's aptly named, since its floor to ceiling windows allow sunlight to come pouring in during the day, and it also allows for great views of the landscape. I was greeted with this lovely view out the window of our room as the sun set over the mountains. I'll take it! I ate three meals at the Dining Hall. 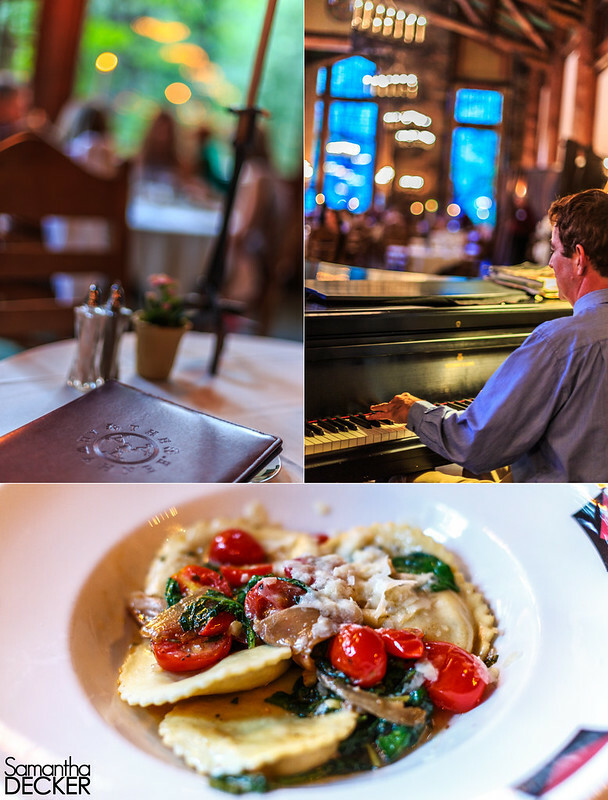 What a gorgeous place to eat! 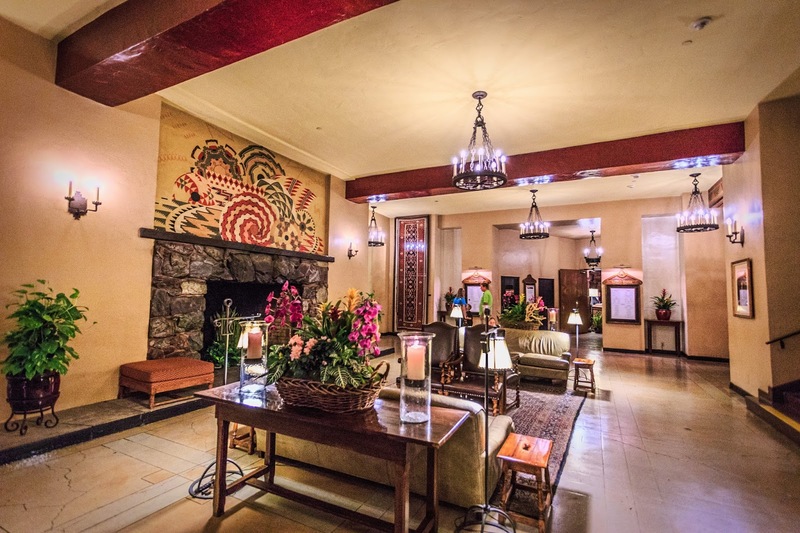 The lounge by the elevator has a gorgeous Native American-inspired mural above the fireplace. 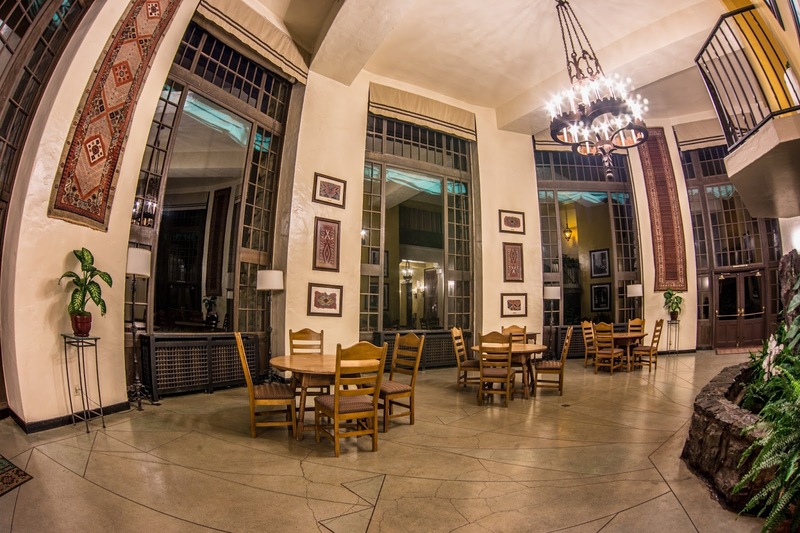 The public areas of the hotel are nearly deserted at night. The Solarium doesn't get as much sun at this hour. 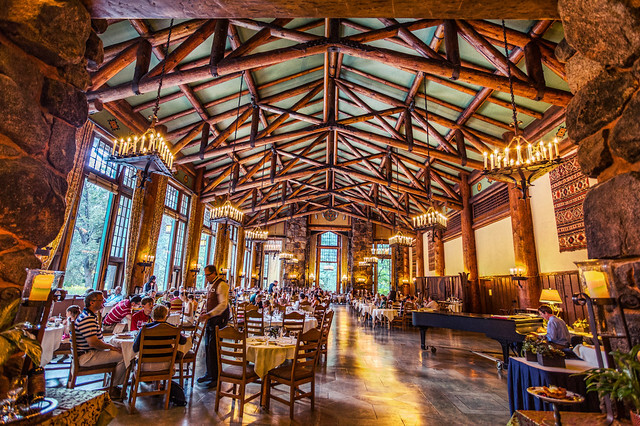 The mural room is named for, well, the mural on display which incorporates much of the Yosemite wildlife. 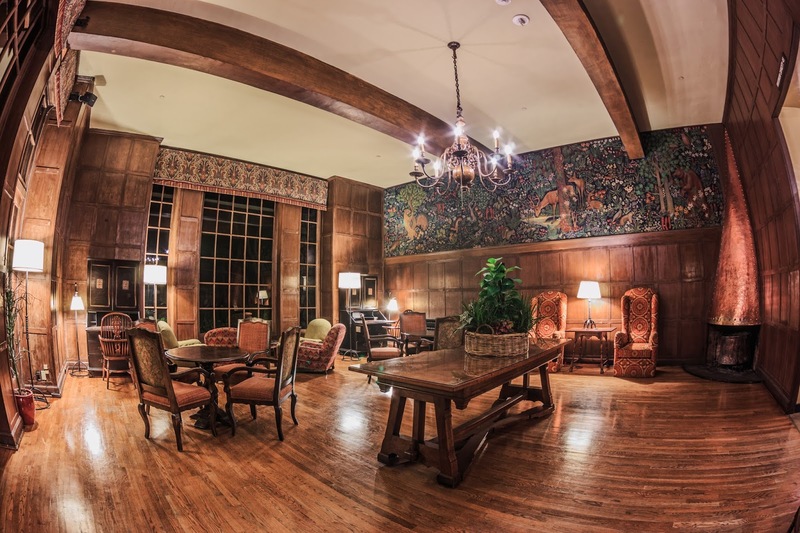 Pictured above and below is the Great Lounge at night. Lots of weary travelers like to take a seat in the Great Lounge in the afternoon and enjoy the sights and sounds (and I saw more than a few plop right down for a nap!). 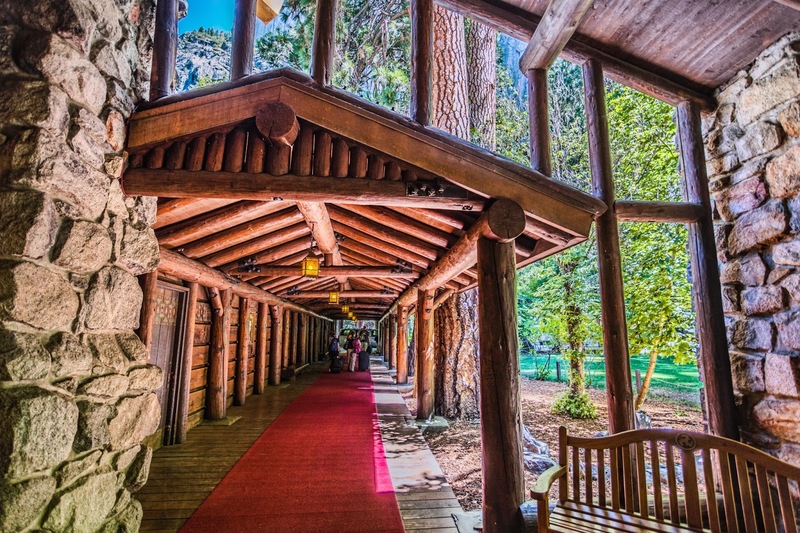 Guests enter the hotel through this portico. The winter sports room is aptly named, with many photos of guests in the early to mid 20th century skiing, sledding, and snowshoeing, among other activities. 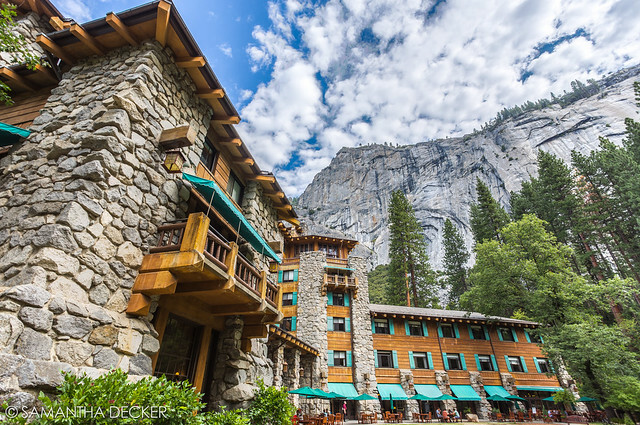 The Ahwahnee's exterior is just as beautiful as its interior, with its signature green trim. I took a lot of photos in the meadow area in back of the hotel. 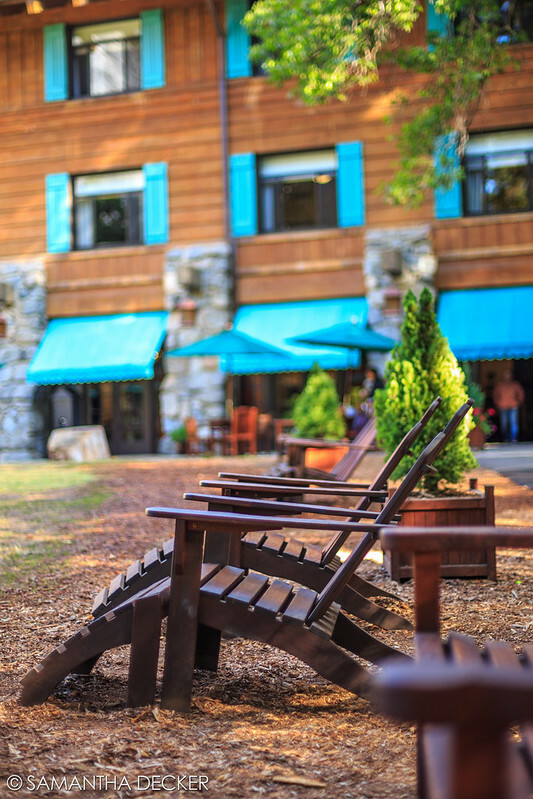 One morning after breakfast, I had just my 50mm lens with me, so I took a panorama of the hotel (above). Another evening, after returning from a moonlight tram tour of the valley, I captured the view below. 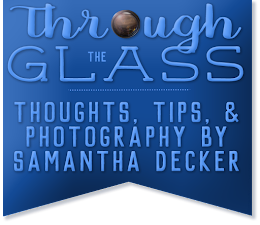 With four different shots to account for the different exposures, several of them processed two or three times to account for the different white balances, this shot was much more complex than I had anticipated it would be. Shots like this don't fare well with automated HDR algorithms, so I was left to do a lot of layer masking to get all the exposures and colors right. The above shot was taken with a fisheye lens, then defished using PTLens. I love the ultra wide look the fisheye gives when defished. 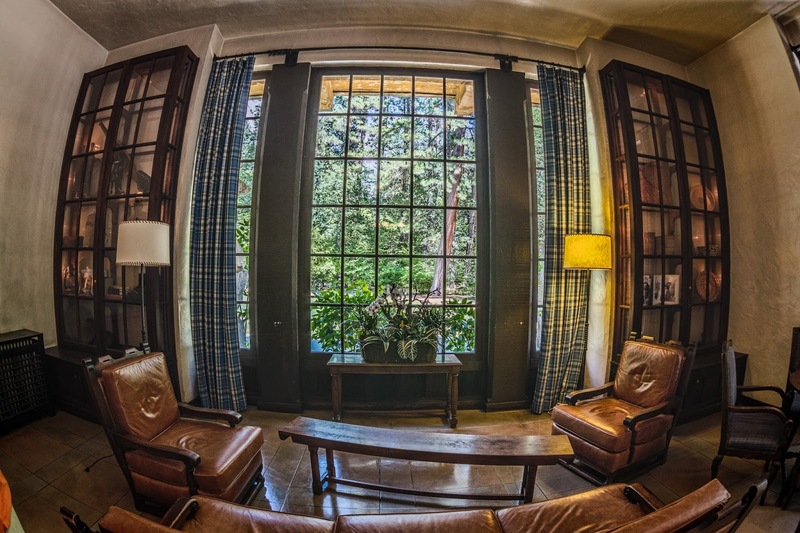 No rectilinear wide angle lens can give you this wide of a field of view! 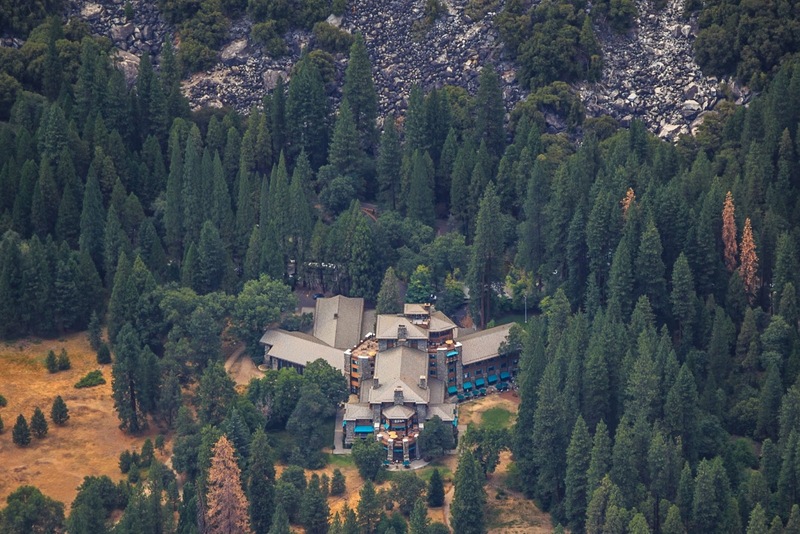 Although I wouldn't consider myself an aerial photographer, the view from Glacier Point did allow me to capture this view of the hotel from above. 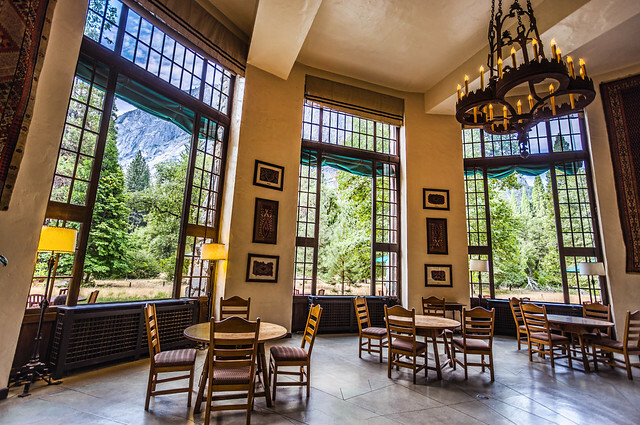 Good-bye Ahwahnee, I miss you already! 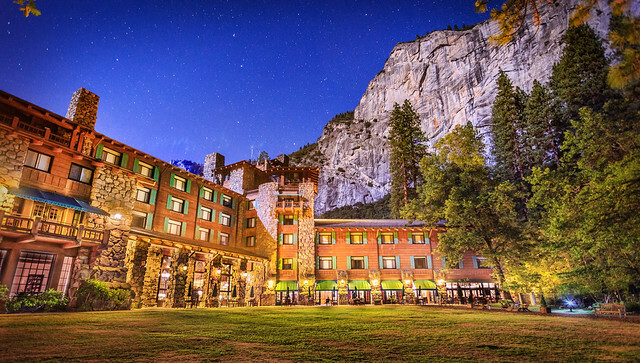 In my next post, I'll take you outside the Ahwahnee to explore the rest of Yosemite National Park!